The NCC presented its plans for the LeBreton Flats at a public information session last month. They are typically grandiose. The most notable feature is a six-lane "boulevard" that will bisect the development. And they still haven't decided on what to do about the contaminated soil. The 1895 Sparks house was wooden-frame, built of plank-on-plank construction, at 420 Meech Lake Rd. at the foot of Skyline Hill, in the woods, not obvious from the road. More than 105 years later, Mr. Murray, unaware of the building, was drawn to it by the persistence of Scout who had lived there until the most recent tenants had been evicted five months previously. In the subsequent months, Mr. Murray entered the building many times, often with his friend, Andrew McDermott of Ottawa. They found it suffering from shocking neglect. They gradually learned more about the building and its longtime owner, and after diligent documentary research on Mr. Sparks, Mr. Murray took great pains to try to save the building as a window on the past, notably on Mr. Sparks and his vision. He found no interest, but from a National Capital Commission official, Giselle Kelley, he learned that the NCC intended to demolish the structures on the site "in the coming months" -- without any public consultation. Mr. Sparks still seemed an embarrassment to the NCC, as the most articulate spokesman for a thoroughly public park after the NCC's expropriation, beginning in the 1950s, of the proliferating private residences in it -- including, with his approval, Mr. Sparks's own house. Mr. Sparks accused the government of shooting itself in the foot by spending millions for new roads, notably the southerly section of the Gatineau Parkway leading to Tache Boulevard, that escalated property values before it had negotiated to buy out the owners. Just 20 years after Mr. Sparks's death in 1959, the NCC had stopped even the purchase of private property on the market, let alone expropriation. At 10:52 p.m. on July 15, 2001, the Sparks house was enveloped in flames and lost forever. After that, NCC heavy equipment moved in to landscape the site. This erased outbuildings and all other memories of Mr. Sparks -- except for a fireplace, cold and black. [...]Old-timers have been talking about an incident more than three decades ago. Skiers came upon park officials demolishing, without public consultation, part of Mr. King's bequest to the nation, small homes and outbuildings on the Kingsmere site, because they had been allowed to become a nuisance to maintain. The public outcry led the outraged skiers to found the Historical Society of the Gatineau. Unfortunately, this sort of neglect is absolutely typical of the NCC, not only in Gatineau Park but throughout the Greenbelt. What's wrong with the National Capital Commission? When I first heard about the Christmas Lights across Canada event on Parliament Hill on Dec. 6, I thought it sounded like a great way to kick off the holiday season. So, I made complicated arrangements to take some kids on the 45-minute drive downtown to see it. The Carp Valley Press said the festivities began at 5:45 and the lights would be turned on at 6:16. But the morning of the event, CBC radio said that the festivities began at 6:30. So I called the NCC and asked for the correct times. The spokesman said the lights would be turned on at 7 p.m.
To be safe, we arrived on Parliament Hill at 6:45 only to find that the lights had already been turned on and the concert was wrapping up. We were very disappointed, as were many others who were arriving at the same time. This kind of incompetence is unacceptable. The Citizen reports that Canadian Gateway Development Corp. is suing the National Capital Commission for cancelling its proposed project for the Daly site. The statement of claim was filed Nov. 6. Gateway is demanding amounts for breach of contract, defamation, aggravated damages, foregone costs, lost opportunity, lost profits, damages for copyright infringement, interest, legal fees and other relief to be decided by the court. "On June 28, 2000, Gateway was advised by the NCC that it doubted Gateway's prospective tenants' ability to obtain the necessary financing for the construction and operation of the aquarium component of the development in a timely manner and that the NCC, arbitrarily and unilaterally, would decide, two days later, on June 30, 2000, whether to terminate negotiations," the document said. The corporation then extended that deadline to Aug. 30 and Sept. 30, 2000 for a number of conditions, the statement of claim said. "The NCC was continuing a pattern of imposing arbitrary and unreasonable deadlines without any proper justification and without taking into account the complexity of the development and Gateway's specific circumstances, contrary to its duty to exercise its discretion, to negotiate and bargain in good faith," the document said. NCC statements to banks that it was in breach of its agreement "were false, misleading and defamatory and constitute an attack on Gateway's character and reputation," the papers said. Gateway claims that the NCC's statement "has lowered Gateway in the estimation of both the Toronto Dominion Bank and the Bank of Montreal and have impaired Gateway's reputation in the development and construction community," the documents said. In one of the most interesting claims in the scathing document, Gateway maintains that the NCC became involved in the Canada's Sports Hall of Fame project. "It is Gateway's best information that the NCC suggested to Canada's Sports Hall of Fame that it consider exploring negotiations with the other three proponents in the second (bidding) process when it knew or ought to have known that Canada's Sports Hall of Fame had already entered into preliminary discussions and arrangements with Gateway and that Gateway had been selected by the Regional Municipality of Ottawa-Carleton as the developer for (the) ... project." Gateway also claims the NCC acted in a "high-handed, reckless and callous manner." Well, there's a shocker. The Quebec government has approved the construction of the McConnell-Laramee autoroute through Gatineau Park. The project still requires federal approval, and a federal Environmental Assessment screening report is expected to be released within a few weeks. The Canadian Parks and Wilderness Society opposes the road, noting in particular the lack of a cumulative impact assessment to determine the impact the cumulative fragmentation of Gatineau Park caused by existing, new, and future roads, noting that "this would be the 4th road transecting the park in its southernmost 3 kilometres, adding up to devastating fragmentation." As the National Capital Commission works toward turning Leamy Lake Park into a golf course, they're naturally eager to minimize the park's ecological value, to the extent of literally erasing its ecological status from the park sign. This photographic gem is provided courtesy SOS Leamy Coalition for the Preservation of Leamy Lake Park. Meanwhile, the Committee for the Environmental Assessment of the McConnell-Laramee Highway is taking the Quebec Government to court to force a proper environmental assessment of the NCC's favorite road building scheme, the McConnell-Laramee highway. At stake is the health of Gatineau Park, which the highway will bisect, and downtown Hull, already the victim of huge expropriations in the 1970's. The NCC is selecting a contractor for the work of cleaning the flats, which now won't begin until spring 2002. Meanwhile, the NCC is holding a public information session Tuesday, Nov. 13, from 7 to 9 p.m. at the Tom Brown Arena to provide an update on the Flats development. National Capital Commission Chairman Marcel Beaudry has missed the point. He erroneously claims widespread public consultations were done on the questionable parts of his plans for the site that I challenged. There have many examples: the abrupt decision to locate the Canadian War Museum there; the development of environmental assessment arrangements for the serious, widespread contamination problems on the site, which include dumping contaminants on-site at the Nepean Bay Landfill near the Ottawa River; the lack of truthful public disclosure and debate about creating heavy traffic on up to a six-lane highway through the site; and the concept plans being developed behind closed doors for blocks labelled as X, W, O, U and T so that disposal and private-sector construction can begin next year. The NCC chairman takes wide liberty if he really believes the general public was consulted on such basics. There is time to remedy and improve these LeBreton Flats plans with more than token public consultations. After all, Mr. Beaudry writes in his letter that the site is a national significant place to be "treasured by Canadians and residents of the capital for generations to come." As the National Capital Commission continues with its plans to plow the McConnell-Laramee expressway through Gatineau Park, a damning critique presented at hearings held by the Bureau d'audiences publiques sur l'environnement on the proposed highway in April 2001 raises a few good questions. The NCC, strongly in favor of building the expressway, coyly refers to it as a gateway to Gatineau Park, even as the finished road will neatly bisect the park. The NCC's current position is in direct conflict with the recommendations in a study it commissioned in 1994, and its continuing mania to build this highway is just one more reason to abolish the NCC. The National Capital Commission's record for project management is at least consistent. Schedules and budgets are simply guidelines overtaken by surprising events. Winter, for instance. What a surprise that is here in Ottawa. It makes construction a lot more expensive, so the NCC's Champlain Bridge widening will be delayed once again. This kind of thing does not give the public great confidence about the commission's ability to run development projects. It's not an isolated example. The NCC site at the demolished Daly Building, a key piece of Ottawa's downtown, has been a fenced vacant lot for the last decade. As the National Capital Commission and their contractor Fullercon Limited prepare to take the winter off, maybe the NCC's bridge people should talk to their Canal people and get a few tips on that chilly period between fall and spring. The public service union of Quebec says the province's Environment Department should never have approved a golf course at Leamy Lake without consulting staff and the public. For information on the Coalition to Protect Leamy Lake Park, contact CREDDO (Conseil regional de l'environnement et du developpement durable de l'Outaouais) at creddo@infonet.ca. Website (French) at http://www.infonet.ca/creddo/ (note: incompatible with some browsers). The website also includes information on the McConnell-Laramee freeway project. The arbitrary and autocratic nature of development became apparent earlier this year when the Prime Minister and NCC Chairman Marcel Beaudry, along with Heritage Minister Sheila Copps, abruptly announced that a new War Museum would be plonked down as a central part of the LeBreton Flats "plan." This happened even though there were already advanced plans and private fundraising in progress for the War Museum at a much more suitable location on the former Rockcliffe air base. It also bumped the planning under way to use the same northern part of LeBreton Flats as the future home of a cultural complex with a combined National Library, National Archives and Science and Technology Museum. The public was never asked which of these multimillion-dollar plans made more sense in helping establish a vibrant downtown. Nor were any alternate uses of this space raised. The other part of the current LeBreton "plan" calls for the sale of the remaining larger southern section of the Flats for private residential and commercial development. Right now, the NCC is pushing for construction of a few blocks of highrises and lowrises, to begin as early as next year. This, too, is viewed as a fait accompli, with no regard for the public costs and before environmental cleanup plans are aired and developed. The NCC's own secret polling of developers indicated that not all of those responding were convinced of the viability of proceeding now with such development, or the wisdom of a wholesale sell-off of the southern lands. Some developers also told the NCC that this massive project was beyond the NCC's ability, and that the likely result would be just another mundane suburbia project. [...]"Urgent" top-down planning began in earnest on LeBreton Flats once the NCC, notorious for its unaccountable nature and with an unenviable track record as a developer, assumed prime ownership of the site a few years ago. About 40 years ago, it was a heavy-handed government-driven process that resulted in the wholesale destruction of many homes and businesses at that site. Alternative plans for what could be an exciting downtown area, with ample open space that rehabilitates and reinvigorates the area's environment, have not been adequately debated and reviewed. Too much wheeling-dealing has gone on behind closed doors. It's a one-sided, ad hoc, and highly political development "plan" that does not add up unless the public wishes to give the NCC and the PM a blank cheque to proceed. It's a Daly site project writ large, complete with on- and off-again plans, increasingly expensive costs and a relatively unimaginative and counter-productive design. The architects for the new War Museum have been chosen and the NCC is "going to move on [cleaning the land] straight away because we have a very tight schedule to do the whole project." They've been futzing around for 40 years, and they demolished the area in the first place, but OK, we're prepared to believe they're now going to get right on that. Another critic, Gordon Cullingham of the Historical Society of Ottawa, draws a distinction between local streets, like Sparks, and streets that are national in scope, like Wellington. "Sparks is the old civic, commercial street," he says. "It's Ottawa's street, not Canada's street, and (the NCC) stealing it." [...]Echoing the views of many in the heritage community, Cullingham says the plaza, with its vista leading up to Parliament Hill, ignores the Gothic architecture and character Ottawa shares with London and instead "tries to ape the great classical capitals of the world, like Washington and Paris." Cullingham says he believes the plan is being pushed aggressively by a prime minister who wants to leave behind a legacy to the capital. "He wants (the NCC) to get rid of a lot of buildings so people can see his big castle on the Hill." Cullingham says the plaza would split the Sparks Street Mall into two parts, obstructing sauntering shoppers and killing commerce. NCC board member Marc Denhez says NCC planners are specifically trying to avoid interrupting the flow of pedestrian traffic along Sparks. As well, they are striving to preserve the traditional east-west view along the street by maintaining the front exteriors of the buildings it incorporates in its development. The latter issue has provoked angry responses from heritage organizations, who say maintaining only the facades of buildings while destroying what's behind them, would leave only hollow shells of historic structures. No announcement was made concerning the properties east of the Bank of Nova Scotia, but one can only fear the worst - we can be certain that the plan to create a plaza to give a better view of parliament (by demolishing buildings) hasn't died. In addition to the original $40 million the NCC was given to "revitalize" Sparks Street, Treasury Board has given them another $2.56 million, apparently "to undertake detailed studies and planning work on the revitalization of the area." It's sad to think that the people at the National Capital Commission actually believe all the guff they delivered to the public this week, but they probably do. How else could they carry on with their redundant paternalism? Tuesday's public general meeting, the first of its type, was billed as proof that the new and improved NCC would be more open and pay more attention to the public. If that was its real goal, it fell sadly short of the mark. NCC chairman Marcel Beaudry dealt with public questions with a combination of obliqueness and lectures while the members of his board looked on silently. Senior staff chipped in the sort of bafflegab that only planning bureaucrats can produce. The apartment building and shops the NCC has approved for the Daly site "will bring resolution and some real vitality," says NCC executive John Abel. We're to be impressed because there will be a little row of trees and wider sidewalks on each side of this banal effort. There was lots of talk of linkages and pedestrian interaction. A more honest summary would be that the NCC, desperate after more than a decade of fumbling on the site, had grasped at any project that was likely to be completed. A good question to ask about this project, and many others of the NCC, is why do we need a federal agency to do this work? Surely there is no national interest in holding the lease to a downtown apartment building. The audience was told about the NCC's exciting plans to "revitalize" part of Sparks Street. The revitalization consists of preserving the facades of old buildings while working with a private developer to create some glass office and retail monstrosity behind the false fronts. The NCC seems to believe that heritage preservation consists of nothing more than preserving the front walls of buildings. [...]The NCC board was conspicuous for its lack of contribution to the meeting. From what little we know of real NCC meetings, the board members have little more to say in private. After all, they aren't from here. What do they really know about the kinds of things the NCC does? The short answer is that they know what Marcel Beaudry tells them. The NCC is a one-man show. The National Capital Commission's first annual general meeting went pretty much as anyone with a passing familiarity with the NCC might expect. The meeting, one of the superficial recommendations made by Glen Shortliffe in a report released late last year, lived up to its billing in every respect. For roughly an hour and a half, the NCC presented some slideshows and an amateurish video extolling their own virtues. And then the crowd got to hector Marcel for another hour and a half during a meaningless question and answer session. With the members of the NCC Board of Directors flanking him on either side, serving much the same purpose as the stage backdrop and the potted plants, Chairman Beaudry got things rolling with a 15 minute speech that was as bland and uninformative as it was patronizing. Four slide show presentations, on Sparks Street, Leamy Lake Park, the Daly site, and the LeBreton Flats, followed in quick succession. The NCC finished its presentation with a branding exercise, in the form of a short amateur video entitled "Our passion, our mission, your capital." Whatever. The question and answer session was enjoyable if only for the pleasure of watching Chairman Beaudry and his 14 apparatchiks maintain their plastic smiles throughout the entire charade. Members of the Moffatt Farm Citizen's Coalition and the coalition opposing the Lac Leamy golf course were best represented. Chairman Beaudry fielded virtually all the questions, responding with some breathtakingly patronizing bromides, at one point even going so far as to credit the NCC and its forbears for whatever quality of life the region has. The National Capital Commission is having their first annual general meeting Tuesday September 25, 2001, from 7 - 10 pm at 200 Promenade de Portage, Hull, 3rd Floor. Phone (613) 239-5555. Unfortunately, canada.com was recently redesigned, with the effect of breaking all links to archival Citizen material. It's quite a shame actually, as what was a useful resource for local news with real content has been turned into just another headline site without any permanent content. This also means that many links on NCC Watch no longer work. Michael Polowin, a lawyer specializing in municipal affairs, said retroactive raises are not common for executives, but they do occur. However, Mr. Polowin added that retroactive raises rarely exceed a few months for top management. "Is that unusual? Yes," Mr. Polowin said of the period for which Mr. Beaudry will be paid retroactively. The 1950 Greber plan, under the guidance of the amateur landscape architect William Lyon Mackenzie King, emphasized parkland above everything except the removal of rail lines from downtown. Greber was behind the creation of the parkway system that monopolizes the waterways in the region. Without question, the "greening of the capital" is one of the federal planning body's greatest achievements -- the Greenbelt and the generous parks surrounding many of Ottawa's public buildings are important features that practically define the city in the minds of many people. But it's now reached an alarming level of fetishism, especially since the industrial menace parks were supposed to fight is no longer the threat it used to be. The parkways -- the Ottawa River Parkway, the Rockcliffe Parkway, Colonel By Drive, the Queen Elizabeth Driveway and Prince of Wales Drive -- are all pretty, and they're better than factories. But that's about all you can say for them. The NCC's plan for the capital holds that the waterways are to be "accessible, continuous symbols of Canada's natural and cultural heritage," which is the kind of thing that sounds good until it becomes clear they aren't to be used for anything interesting. The parkways' monopoly on monotonous waterfront land use is a shame. Compare the uses other Canadian cities make of their waterways. Vancouver's glorious marine districts, from the natural beauty of Stanley Park to the cultural attractions of Granville Island, are exciting. Toronto's harbourfront is notoriously unfinished, but it has marinas and swimming pools and Queen's Quay, not to mention Ontario Place and the Canadian National Exhibition. Montreal's Old Port is one of Canada's great attractions, and its Lachine Canal is experiencing an expensive but exciting rebirth as a centre for culture, recreation, and loft studios and apartments. Even Halifax's sewage-laced harbour has popular restaurants and music venues. Ottawa has parks. A hundred kilometres long between them, and all 10 metres wide. These make sense as part of the monumental capital the NCC has striven to build, but not as components of an exciting, livable city. The roads make the waterways appealing stretches on which to drive, but act as barriers to pedestrians. The canal is difficult to get across on foot in the summer. These problems of passage aren't hugely important now -- but only because if you're standing by one of the rivers or the canal, what's over there isn't any different from what's right here. We can do better, without sacrificing much of the pleasure so many Ottawans get from the waterways as they are now. We must suspend our aversion to public commerce -- the Ottawa River doesn't need a shopping mall on its banks, but restaurants and cafes and bike-rental shops and artists' studios are nothing to be afraid of. We must make the waterways more accessible -- they're now interesting to travel along, but often difficult to get to. We must be courageous in demanding changes in planning policies that maintain Ottawa as a monument and prevent it from reaching its potential as a city. Residents of Carleton Heights are still fighting the planned development of Moffatt Farm. The land was given to a developer by the National Capital Commission in exchange for Montfort Woods. For more information, contact the Moffatt Farm Citizen's Coalition. Access to information researcher Ken Rubin continues to dig up interesting items about the National Capital Commission: In exchange for paying for Canada Day fireworks (about $180,000), Kodak has bought advertising, exclusive rights to selling film and cameras at NCC events, and is guaranteed to be mentioned at least 25 times during the Canada Day show. Tip for the NCC: put the Kodak logo on all those flags people wave at the show as well -- that oughtta be worth a few grand. The arrogance of the devilish alliance of the golf course -- the casino, the Quebec government (ignoring the views of its public servants), the mayor of Hull and the chairman of the National Capital Commission -- contributed to the revolt. Earlier in the summer, a portion of the park was closed so that dozens of mature trees could be cut, an operation that made room for new grandstands. Apparently, the natural environment that had been used for years to present the casino fireworks would not be comfortable enough for the Francophonie Games. Who had planned that change? Who had given authority to proceed? Who was to blame for that massive destruction? It was almost impossible to divide responsibilities among the city, the NCC and the Games' organizers. All we could see was the big impact on the ground. But later, everybody could recognize how every member of the alliance was involved in some manner in those machinations when the closing of the Games, taking place in front of the new grandstands, received a new international name: The Casino de Hull Closing Ceremony. The friends of Leamy Lake might have wished that this title was literally true, but all they were left with was the huge imprint left for the future benefit of the would-be owner of the whole place. More and more people feel the fight for the park is going to last a long, long time. There is still confidence that the battle against the golf course will be won. After all, the first players were supposed to be playing on the course in 1999. In the last three years, the environmental case has been developed convincingly. Furthermore, the public now knows that the $250-million hotel investment did not require the destruction of the park, as was originally claimed. Here's a good summary of the National Capital Commission's plans for the LeBreton Flats from the Centretown Buzz. But while the summer tourist crowd picks over Mr. Cook's hoard of crafts, T-shirts and Mountie models, a secret meeting between the National Capital Commission, the city and seven private interests could be destroying his business. It's what the Ontario Municipal Board calls a "mediation" between these groups, which have conflicting ideas on the NCC plan to create a Metcalfe ceremonial square between Wellington and Queen streets. It's not a formal hearing, so it's not public. If it goes through, the plan would see Mr. Cook's building, constructed in about 1860, moved down Sparks to make way for the square and a $40-million redevelopment. The "Chretien square," as the 79-year-old Mr. Cook calls it, would kill the store. "I would go out of business," said Mr. Cook. The National Capital Commission is forcing the Ottawa BluesFest to move from the LeBreton Flats because, get this, no one expected the Flats to be developed so quickly: "Guy Laflamme of the NCC says they weren't even dreaming of developing LeBreton Flats in such a short time frame." Guy, it's been 36 years. The Ontario Municipal Board is having meetings with the National Capital Commission and property owners at City Hall to discuss the NCC's plan to demolish buildings on Sparks Street to create a "ceremonial square." The meetings are closed and run from July 16 to 18. "Stalinist Planning Writ Small: A people's history of the NCC"
First settlement on the north side of the Ottawa River. Notably, this was done without the aid of NCC planners. A town is founded on the south side of the river when the building of the Rideau Canal begins. Incredibly, this too was done without any advice from the NCC. Ottawa is chosen as Capital of the newly formed Province of Canada (created from Upper and Lower Canada, parts of today's Ontario and Quebec). The NCC regrets that it wasn't around at the time so that it could come up with this idea first. But if they had been, they would have, you bet. Formation of the Ottawa Improvement Commission "to beautify" Ottawa. It clears industry from around the Rideau Canal and creates parks and Ottawa's first scenic parkway. It then snubs the remaining industry by spreading vicious rumours about it and never inviting it to dinner. Todd Plan: Expresses the idea of a Capital region framed in a network of parks. Pushes for a boulevard to link the Parliament Buildings to Rideau Hall. The story behind this is classic Federal Government planning in action: Sussex was one of Ottawa's first and most successful commercial streets, but Lady Aberdeen, wife of the Governor General, wanted to enjoy a "beautiful ride on her way from Rideau Hall". She eventually got the government to expropriate the entire west side of Sussex, except for the Daly Building (that would be taken care of later). The Connaught Building was built between 1913-1915, but then the rest of the land stayed vacant. It was used as a parking space for decades. The U.S. Embassy was finally built there in the 90s. Holt Report: Recommends establishment of a federal district planning authority and extension of the park system. Yet Another Report: Boldly supports the idea of a new planning authority, recommends removal of rail lines from the centre, building of highways, extension of the park system, general tidying up. The Federal District Commission is formed with the authority and budget to enact past recommendations. And, according to this time line anyway, promptly does nothing for the next 20 years. This period is now looked back on as something of a Golden Age. Greber Plan rather imaginatively recommends emasculating Ottawa's rail network and building roads, decentralizing government offices (resulting in those triumphs, Place du Portage, Les Terraces de la Chaudiere, Confederation Heights, etc. ), and expropriating vast amounts of land for the Greenbelt. The National Capital Act sets the mandate for a new kind of planning authority (just like the old planning authority). The NCC expropriates land for the Greenbelt from people like the Woodburns. The National Capital Commission (NCC) is formed to carry out recommendations of the Greber Plan. Of course, they've no intention of stopping there. True to their ideals, the NCC expropriates and demolishes the LeBreton Flats. Incredibly, this was planned without consulting the people who actually lived there. The land remains vacant. The NCC generously decides to not demolish Ottawa Union Station, figuring a vacant lot might not look so good during the Centennial. The train station was however moved to the suburbs, guaranteeing its irrelevance. The rail lines were replaced with roads such as the Nicholas Expressway. The Federal Government expropriates the north side of Sparks Street, essentially freezing development and accelerating its decline. Fearing its budget isn't growing fast enough, the NCC persuades the government to expand its mandate to include public programming, because the public need programming. After neglecting the building for a decade, the NCC demolishes the Daly Building in the heart of Ottawa, quashing plans for its restoration. The land remains vacant. The NCC conceive a Vision for the Core Area (complete with a plan to demolish Metcalfe Street), approve a Plan for Canada's Capital, prepare a Core Area Concept of Canada's Capital, and develop a Core Area Sector Plan. That's two plans, a vision, and a concept. On the practical side, the development of the Daly site flounders. The fate of one of Ottawa's most historic and vital downtown areas will be deliberated in secret. The Ontario Municipal Board will hold meetings from July 16 to 18 at Ottawa City Hall, with the National Capital Commission and downtown property owners on one side and the city on the other. At issue are historical designations passed by the former city of Ottawa last year for the Sparks and Bank streets area and the city's recommendation that the districts be turned into national historic sites by the National Monument Board. The NCC wants to create a $40-million ceremonial square extending from Wellington to Queen streets, in conjunction with the commission's Sparks Street office, retail, parking and housing redevelopment. The proposals would clash with the city's heritage designations and could prevent the NCC project. [...]"The discussions should be in a more public venue," Alta Vista Councillor Peter Hume said. "Open always has to be better. [...]Mr. Hume said the OMB mediation was chosen by the parties involved because it would be less likely to generate criticism. The NCC backed off from building a ceremonial boulevard from the Parliament Buildings to the Museum of Nature along Metcalfe due to a storm of public protest. The scaled-down proposal to build the square has been dubbed "Metcalfe Lite." NCC spokeswoman Laurie Peters would only confirm the date of the meeting and said local lawyer Peter Vice would represent the commission. The Sparks and Metcalfe projects would result in the demolition of a number of historic buildings and moving the Marshall and Telegraph buildings in the area, said heritage critic Barry Padolsky, an architect. "The NCC's proposal to move and destroy historic buildings violates the whole essence of the heritage district that the city has designated," Mr. Padolsky said. - permit bids only from developers with proven, innovative records. The above approach worked spectacularly in Berlin in the 1980s and has worked for decades in Helsinki, the western world's poster child for a delightful, humane, and livable city of "villages." Public/private partnerships in other Canadian cities are rapidly outpacing Ottawa. That's a pity. Ten years on, and the NCC has (once again) decided on a plan (and they really mean it this time) for the Daly site. After a rigorous competition, the winning proposal is for ground floor retail and luxury condominiums, making a mockery of the NCC's aspirations for a tourist attraction of some kind. No "crucial" aquariums this time. Which is all fine and good - the aquarium fiasco obviously injected a dose of fiscal reality into the whole ludicrous process - but begs the question: Why is the NCC necessary for a project that any developer could undertake? Why didn't they just sell the property and have someone build this rather banal project 10 years ago? As it stands, the NCC will continue to own the property, leasing the site for 60 years. Turns out Claridge's proposal is the most profitable, netting the NCC $100 000 a year for the duration of the lease. As for those high-minded ideals of protecting sites of national interest? Fuggetaboutit. They hope to complete the building by late 2003. "We are facing a difficult problem in bringing together all the ideas that have come forward in the last couple of days," said Gilles Paquet, director of the University of Ottawa's Centre on Governance, said yesterday during the final session of the city's Ottawa 20/20 Smart Growth Summit. "(Municipal, federal and NCC leaders) are not always singing from the same songbook." A speech from National Capital Commission chairman Marcel Beaudry surveyed the commission's history in Ottawa and current plans for adding residences to Sparks Street, creating a Metcalfe Street plaza and building on LeBreton Flats, before he found himself defending the NCC's role. "Most community association representatives have very little trust for the NCC," said Action Sandy Hill president Peter Marwitz, who echoed thoughts voiced by others in the audience and on the summit's Web site that the NCC should work more co-operatively with the city and community groups, or even relinquish its power. Mr. Paquet suggested the federal government's voice in Ottawa should be concentrated in the NCC, instead of spread out among Public Works and other departments, to allow the NCC and the mayors of Ottawa and the soon-to-be-amalgamated Outaouais to negotiate effectively. But Mr. Beaudry said he saw little need to change the current arrangement. "There are some (community associations) that have always been negative about the NCC and I don't think we're going to be able to change that, whatever we do. On the other hand I think most of the population feel that we're doing a good job," he said, adding he can't see the NCC gaining any more power than it has now. "There's so many departments involved. Transportation, for instance -- I don't see Minister (David) Collenette would be turning over his responsibility to me." They've set up some forums, so head on over and let them know what you think of the NCC. By this fall, the casino complex will include a 350-room Hilton Hotel, a convention hall for as many as 1,800 delegates, and a 1,000- seat theatre featuring Las Vegas-style variety shows. Construction of all three is almost complete, but the casino has so far been thwarted in its plans to build a golf course in Leamy Lake Park, beside the casino, because of public opposition and environmental objections from the federal government, which owns the parkland. The National Capital Commission, which favours using the land for a golf course for rich gamblers, says it believes the environmental objections have been met. But it is likely to be several months before the casino gets approval to begin building the course, NCC officials say. Meanwhile, the NCC plans to reopen an archeological dig in the same park. Presumably, this will be happening in the part of the park that isn't being turned into the golf course. Then again, it could make for some interesting hazards. Fore! 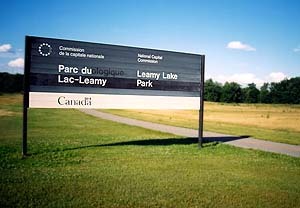 Leamy Lake Park is owned by the NCC, a Federal Government Crown Corporation. The Quebec Government wants to build a golf course in the park for its Hull Casino, and has paid the NCC 3$ million for the privilege. Officials at Environment Canada and Fisheries and Oceans Canada have ordered an indefinite delay of the proposed course, saying it threatens the environment. Who says we have too much government in this town? According to the NCC's documentation, the Montfort woods are of national interest "in order to preserve the mature maple forest as a natural area for the benefit and enjoyment of future generations in the Capital and for the protection of the parkway corridor." The woods are nice. The trees are tall and leafy, the squirrels plentiful, and bumblebees and dragonflies buzz along the forest floor on warm afternoons. A firepit in a rocky clearing suggests people have spent evenings under the stars amid the trees. The woods are criss-crossed with trails of earth packed down so hard they might as well have been paved. People obviously love the forest, and it's a shame somebody wants to cut it down. But whether it's of national interest is another matter entirely. Aviation Parkway is one of the NCC's odder projects; it doesn't really lead anywhere in particular and it's not long enough to be a uniquely interesting drive. The idea that the parkway needs protecting is bizarre, assuming Mr. Kochar wasn't planning to build right up to the road (and the configuration of the orange, spray- painted stakes demarcating the property line suggest that he wasn't). The reason Mr. Kochar would be willing to trade the woods for part of Moffat Farm is obvious. The Montfort Woods are tucked away in a part of town near few amenities and with no easy rush-hour route anywhere many people want to go. That makes it less attractive to prospective home buyers. But Moffat Farm is riverfront property with easy access to downtown, Hog's Back, the airport, Carleton University and what is likely to become Ottawa's light-rail line to Kanata. As well, the chunk the NCC wants to trade to Mr. Kochar will border the other 27 or so hectares of forest and meadow. If the terraced backyards and boathouses on the opposite bank of the Rideau River are any indication, DCR Phoenix could make huge profits developing the site. Ottawa's official plan has Moffatt Farm zoned as open space. Not satisfied with their $80 million budget and substantial landholdings, the NCC is looking at ways of boosting its revenue. They got staff to submit any idea, no matter how preposterous, in brainstorming sessions for pumping up revenues. The NCC is apparently only serious about a few of the ideas, including entrance fees for selected Winterlude events, fall colour viewing in Gatineau Park, and even year-found fees on the Gatineau parkways. How about a bake sale guys? The NCC is dropping $750,000 on a tourism campaign with the goal of making Ottawa the third most popular destination in Canada. For the benefit of all Canadians, of course. Three surviving developers have submitted their final proposals for the Daly site to the NCC. The winning proposal may be announced June 29; the NCC, ever the optimists, hopes construction will finish in two years. The deadline for the latest proposals for The Daly Building site is fast approaching. The winning proposal must be "something where there's activities seven days a week, 14 hours a day, [...] open to the public, that generates a lot of activity and compliments the adjacent uses, and becomes a destination." Whatever. The NCC has purchased yet another building on the south side of Sparks Street. Not surprisingly, after paying $9.2 million for 100 Sparks, significantly above the assessed value, the NCC is trying to keep the inflated prices it pays secret. (The 6,500-square-foot building was recently assessed at $1,196,000.) The NCC appears to be pursuing its plan to move and demolish buildings to create a square, dubbed "Metcalfe Light" as it constitutes a scaled-down version of the Metcalfe Grand Boulevard scheme that was scrapped awhile back. As usual, nobody outside of the NCC knows for sure what they are doing. Update: The NCC is looking at three more properties to complete its collection: the Bank of Nova Scotia (118 Sparks St), the Hong Kong Bank (126 Sparks St; owned by Truscan Property Corp.) and Hoops and Yesterday's Restaurants (owned by Stan Ages). Considering the magnitude of the project, it has received surprisingly scant attention. The Chretien government is serious about moving ahead with it. France has its Arc de Triomphe and its Eiffel Tower. Washington has its Lincoln and Jefferson and Washington memorials, Moscow has its Kremlin, London its host of treasures -- and then there is this nation's capital. In Ottawa, a wide range of Philistines are irked that the government would wish to do something to make the capital more majestic and magnificent. They complain that the makeover plan is a Jean Chretien vanity project. They reflect a small-mindedness that is consistent with their abiding colonial psyche. On the planned new piazza or modest version of a Champs-Elysees, as some prefer to call it, there is no monument to Chretien to be installed. There is no plan to name the boulevard after him, nor -- though I am sure he is as conscious about his legacy as other leaders -- does he wish it to be his name. The Canadian Museum of Civilization and the National Gallery of Canada were projects of the Trudeau government, yet these sites have no name identification with that prime minister. All well and good. But even the most wide-eyed optimist cannot deny the NCC's history of incompetence and failure, a sure justification for at least some measure of skepticism. The NCC is still casting about for options on cleaning up The LeBreton Flats. The latest proposal would have the polluted soil reburied nearby instead of moved to a more distant landfill. Update: The Citizen reported May 23 that the NCC withheld estimates on the amount of contaminated soil from a previous (March 2000) consultant's report on the soil contamination. The report was obtained through an access to information request, but most figures in the report were deleted by the NCC. It's official; Sheila Copps, Canadian Heritage Minister, announced a plan to put the War Museum on The LeBreton Flats after all. The plan includes $100 million for the museum and another $60 million to clean the land and move the Ottawa River Parkway. The "Metcalfe Light" plan for Sparks Street is still on the table as well. Park planners predicted in 1992 that pressures from urban encroachment along the park's southern boundaries would make its continued protection problematic. The Gateway sector has evolved into a management liability. Planners reasoned that if external pressures exceed the ability of park administrators to protect natural resources, it would be better to relinquish this sector by developing it intensively. An NCC plan was devised in 1992 to develop the park's Gateway sector south of Gamelin Boulevard, using a so-called "tamed nature" concept. Parking lots, hardened walkways and an amphitheatre were planned. Public opposition at the time was fierce. The NCC shelved the project, waiting for an appropriate opportunity to revitalize the plan. The planned extension of the McConnell-Laramee highway through the park provided its long awaited Messiah. Sacrificing the Gateway sector, however, is an abdication of responsibility, an admission of the NCC's inability to manage the park's natural heritage in the face of mounting urban encroachment. Unfortunately, Gatineau Park is a federal park only by name -- it remains without legislated protection. Park staff admit that no comprehensive life science inventories exist for the disputed area. They insist that even if "species at risk" are eventually discovered, they can be dug up and planted outside the highway corridor, reducing the park to an arboretum. Why blame the NCC, assuming that the highway's initiative originated with the Quebec Transport Ministry? Original studies examining alternative routes had strongly favoured using Gamelin Boulevard to traverse the park. It was determined to be more direct and considerably cheaper. But the NCC, apparently adamant to realize its "tamed nature" project, devised superfluous, nonsensical reasons why the Gamelin option was unsuitable, such as that it didn't optimally serve the two residential sectors of des Trembles and du Plateau bordering the park's western flank. What better mechanism than a four-lane highway to serve as a new formal entrance to channel tourists into the park? The National Capital Commission is squandering any public confidence it has gained over the past decade with improved transparency and public participation. Public apathy is partly to blame. We, who allow these atrocities to unfold unchallenged, perpetuate the government's self-aggrandizing destruction of our natural heritage. The NCC's planned extension of the McConnell-Laramee Highway through Gatineau Park in Hull will destroy some of the largest white pine trees in Eastern Canada. Despite their noble aspirations to "safeguard the Capital's national treasures, the numerous sites of great prestige and public interest that are held in trust for future generations of Canadians," the NCC has always put roads and golf courses before conservation. Despite the NCC's waffling that the "plans for the highway in Gatineau Park are not final," Marcel Beaudry has stated in the past that he wants this road to be part of his legacy. The NCC is once again trying to get something rolling at the Chaudiere Falls. The NCC first floated a plan to develop the Falls in 1998, generating a minor media frenzy. The plans, however, were news to landowner E.B. Eddy (since acquired by Domtar), and they promptly torpedoed it. Now the NCC is back with a proposal to buy an unused portion of Chaudiere Island, still with the long term goal of acquiring the entire island. Just one more illustration of why we don't need the NCC. It is NCC policy to sell land it expropriated to finance its schemes (the Woodburn Dairy Farm is a good example). In this case, the NCC gave the city 100 acres of NCC greenspace in exchange for a zoning change on land now being developed. In effect, they expropriated the Greenbelt in the 60's to finance Poster Collars and overpriced real estate on Sparks Street. For this we need a Federal Crown corporation? It's a ludicrous way to run a city. Phil Jenkins, author of An Acre of Time (a history of The LeBreton Flats) offers pointed criticism of the NCC's plans for the Flats. Best quote: "The only way we can make a dramatic change in the plans? I'd have to chain myself to Sheila Copps, which is not a pleasant thought." Indeed. With the scent of Federal money in the air, seems like everybody suddenly wants a piece of The LeBreton Flats. The Canadian Library Association is now getting in on the action, pressing the Feds for a new National Library, preferably an "architectural gem and a major cultural tourist attraction." Talk of The LeBreton Flats finally being developed is getting more and more optimistic every day as this article attests. Best quote: the NCC claims it is "working feverishly on a servicing plan for Ottawa council approval." Feverishly? Um, it's been forty years, guys. No point in trying to look busy now. And should the NCC's most optimistic plans come to fruition in the best possible way, will it all have been worthwhile? In a word, no. At best, the NCC is capable of creating a comparatively sterile development of modern buildings and Federal monuments. Gene and Edward both remember clearly when, around 1965, the hammer came down and their beloved LeBreton was levelled as part of a plan to beautify the city. They had long since moved to Carlington before the razing, but they remember the time well. While others went to see history being made -- or rather being destroyed -- they refused to go and watch as bulldozers tore down a place 28,000 people once lived in, thrived in and called home. "I never wanted to see it torn down because there were too many memories there. I was too upset to see it go," Edward said. And today, as the Flats stand on the verge of rejuvenation, Edward has mixed feelings. He is relieved that a thriving neighbourhood that became an urban wasteland is finally being put to some use. He likes the idea of a housing development, the parks and museums planned for the area. But he still can't understand why people were forced out and the land left to sit idle for 40 years. And he is still hedging his bets on whether the development will happen in his lifetime. "I don't think valuable land should be empty for so long. But I don't know if the development will happen in my lifetime. I am not holding my breath for it," he said. As to "why people were forced out and the land left to sit idle for 40 years," three words: National Capital Commission. The NCC swears up and down that, no really, the War Museum won't be delayed all that much if it is moved to The LeBreton Flats. Forgive our skepticism. And they're sticking to their story that "it's taken years of negotiations with regional and municipal governments to get to the point where development can begin." 35 years of negotiations, apparently. Jean Chretien is apparently one of the driving forces behind plans for museums and monuments on The LeBreton Flats, as well as the Sparks Street plaza. Of course, the 'grand design' also included the late, unlamented Metcalfe Grand Boulevard. The NCC, meanwhile, is waiting for the government to commit to putting the War Museum on the Flats before starting development. The article ominously compares the Flats to Hull, stating "LeBreton Flats represents the largest development in the capital since the federal government turned much of downtown Hull into office towers for bureaucrats 20 years ago." Here's hoping things don't turn out quite so badly. According to the NCC, the Bluesfest will be able to remain at the LeBreton Flats after it is developed. No word on when that might be. Unnamed sources believe an announcement that the War Museum will be moved to the LeBreton Flats is imminent. Veterans groups remain opposed to the plan, preferring the Rockliffe site, as they believe moving to the Flats will result in delays. The NCC plans to erect fences in the Greenbelt to separate dogs and people. This is actually just the latest development in a soap opera started in 1999, when the NCC arbitrarily announced new rules for dogs on all NCC land. At the time, dog owners complained bitterly about the lack of consultation, something we've come to expect from the NCC. So what's stopping this ambitious LeBreton development? Why aren't the buildings going up now? The biggest stumbling block on LeBreton Flats has always been the environmental question -- what to do about the soil that is contaminated by old factories that once operated at LeBreton. What company would want to start building on contaminated soil? It's equally been the thing blocking any federal construction project. The government simply has to start cleaning up the soil. The cost estimates have varied a lot, but today the NCC figures it could cost between $30 million and $50 million to clean such a large area. Why not just go ahead and make that financial commitment? The end cost may not be that expensive. In fact, the consultant believes it may be cheaper, but that will remain uncertain until the work is started. It's unlikely that the clean-up cost will get any cheaper. Once the clean-up is complete, the government can start to recover its costs by selling land to developers. After 30 years of talk and study about this land, LeBreton is ready for action. The land is now all in the hands of the federal government. An attractive plan is on the books. The only decisions that have yet to be made are which national cultural institutions get the choice riverfront building sites, and how buildings will be planned and built in financially responsible fashion. The government would show that it's serious about going ahead with this important project by starting to clean up the land. Indeed. They've only had 40 years to do the job. War museum's new home on LeBreton Flats? The NCC, eager to transform The LeBreton Flats from a monument to its own incompetence into a monument to, erm, anything else, is lobbying to get the War Museum or Science and Technology Museum (or both) moved to LeBreton Flats. According to NCC mouthpiece Dianne Dupuis, they want to go ahead with development "sooner rather than later" (great idea, guys!). As always, they've managed to create a bureaucratic side show as the War Museum is already planned for Rockliffe, and the Museum folks seem a bit nonplussed at the suggestion of moving at this late date. Our advice to the War Museum: start digging, because if you get stuck on the flats, you're not likely to see a museum for another 35 years. In recent years, the NCC's culture of secrecy has exploded in its face, as leaked plans for projects such as a grandiose boulevard on Metcalfe Street and secret decisions on matters of broad public interest, such as widening the Champlain Bridge and banning unleashed dogs from NCC land, provoked widespread public anger. The communications nightmare, as well as Ottawa's amalgamation and a pending merger in the Outaouais next year, prompted Mr. Beaudry to commission Mr. Shortliffe's report, which proposed 11 changes. All were immediately adopted by the NCC board. But it will cost $1.2 million to implement them, Mr. Beaudry said, adding that a request has been made to Treasury Board for the funds. If that money isn't forthcoming, some reforms might have to be scaled back, he said. But implementation is already proceeding in some areas: Work is under way on the Web site, Mr. Beaudry said, and a new vice- president of communications, the Hull Casino's Guy Laflamme, has been hired. Largely ignored in December when they were adopted, the changes fall far short of what 90 per cent of area residents, polled by Decima for the Shortliffe report, said they desire. They wanted open board meetings, and 76 per cent called for seats on the board for the mayor of Ottawa and the chairman of the Outaouais Urban Community. But Mr. Shortliffe opted instead for a compromise involving an advisory committee. Mr. Beaudry and area MPs Mac Harb, Mark Assad, Mauril Belanger and David Pratt believe the NCC should not hold fully open meetings because of the many issues it deals with that could affect land values, for example, and hinder the complex negotiations required to pull together many NCC projects. Mr. Chiarelli argued that it would be appropriate to have meetings with a "divided agenda": an open portion for regular issues and a closed portion for confidential matters such as contracts, real estate, legal and personnel matters. Several others pointed out that land transactions, legal and personnel matters are the bulk of the NCC's work. Mr. Beaudry and Mr. Harb argued that the mayors would be in a conflict of interest if they sat on the board, torn between their duties to area residents and the NCC's mandate to provide a capital for all Canadians. That argument drew agreement from Mr. Croteau, who said mayors are "political animals" whose loyalties lie with the voters who elect them. But Mr. Chiarelli disagreed. "I don't believe it would be a conflict of interest any more than it would be a conflict of interest for us to sit on a committee, as has been recommended. I think it would be extremely helpful," the Ottawa mayor said. "The mayors used to be on the board a number of years ago." The NCC board also includes, by law, several members from the capital area, he noted. "They're no more or less in conflict of interest than a mayor would be, because they're designated to be from a geographical area," said Mr. Chiarelli. Indeed, when asked to whom she feels accountable in her role as a board member, Ottawa resident Norma Lamont said it was primarily area residents. Despite falling short of the general public's expectations, the Shortliffe changes are not to be shrugged off, observers say. They have a subtle prevalence that some believe will, in fact, change the way the NCC does business. "This is an extremely important step forward," said NCC board member Marc Denhez, an Ottawa lawyer, urban planning expert and longtime NCC watcher, particularly during his time as president of Heritage Ottawa. "This is the most significant change in the way the NCC does business since it was set up in 1958." "I certainly think it's making the board more accessible," said Ms. Lamont, a five-year board member, who is director of special projects for the Children's Hospital of Eastern Ontario Foundation. That Shortliffe's tepid and widely criticized reforms are "the most significant change in the way the NCC does business since it was set up in 1958" says pretty much everything that needs saying about the NCC's dinosaur mentality. The fiasco continues: the NCC has narrowed the proposals for the Daly site to three. In the process, they've turned down a renewed bid from the brainiacs who came up with the aquarium plan that so seduced the NCC last time around. But lurking in the wings is a proposal from another developer who obviously knows how to sell to the NCC, as it will include "something spectacular, a tourist attraction of national interest." Here we go again. The NCC squandered some more goodwill when it cancelled the Ice Dreams snow sculpting competition after the sponsor, the City of Ottawa withdrew. They probably didn't count on the tenacity of some Carleton University students. The students erected a guerrilla sculpture that was promptly demolished by the NCC. A compromise has since been reached, allowing the students to build sculptures, but the competition remains dead. Which does the National Capital Commission need more: a focus on democracy, public consultation, and respect for local elected authority, or a really good marketing campaign? The NCC has just hired Guy Laflamme, the marketing chief from the Casino de Hull, to demonstrate its commitment to the former, despite the fact that his clear expertise is in the latter. Last December, Glen Shortliffe produced a set of recommendations on how the NCC can lose its reputation for secrecy and bungling; one of these suggested creating a new vice-president to handle sponsorships and corporate marketing, speechwriting and media relations, a new consultation process for communicating with the public, and relationships with local government leaders. The NCC's biggest blunders (most recently, the Metcalfe Street "Grand Boulevard" idea) have resulted from the commission's propensity for cooking up grand but misguided schemes and getting halfway through them before asking any of the people affected whether the underlying idea is any good. Mr. Shortliffe's recommendation that the NCC be more open in its decision processes was welcome. Since then, however, the commission hasn't shown that it is paying attention to Mr. Shortliffe's prescriptions. The NCC is, in fact, showing that it's taking to heart the statement in Mr. Shortliffe's report that "the NCC's positive impact and image can be put at risk if some of the perceptions and problems that it faces currently are not 'fixed.' " The quote marks around "fixed" are in the original, and the commission seems to have taken that as a hint that it doesn't need to change anything, just "change" some things -- alter its appearance, not its substance. Perhaps not coincidentally, the Hull Casino is also going to be building a golf course on NCC land, so there's a certain synergy in hiring the casino's head of marketing to fix its image problems. Good luck to him: with the NCC's constant screw ups, he'll need it.